To use MLAudioPlayer as a Swift Package Manager package just add the following in your Package.swift file. If you prefer not to use either of the aforementioned dependency managers, you can integrate MLAudioPlayer into your project manually. Open the new MLAudioPlayer folder, and drag the MLAudioPlayer.xcodeproj into the Project Navigator of your application's Xcode project. Select the MLAudioPlayer.xcodeproj in the Project Navigator and verify the deployment target matches that of your application target. You will see two different MLAudioPlayer.xcodeproj folders each with two different versions of the MLAudioPlayer.framework nested inside a Products folder. It does not matter which Products folder you choose from. The MLAudioPlayer.framework is automagically added as a target dependency, linked framework and embedded framework in a copy files build phase which is all you need to build on the simulator and a device. loadErrorText: String? = "Could not load"
tryAgainText: String? 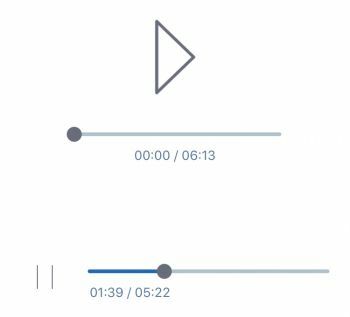 = "TRY AGAIN"
DisPlayer is a customizable audio visualization component that works with recording and playing back audio files. Player for your DRM-free audiobooks. This project is about managing permissions with the customizable visual effects. Localize-Swift is a simple framework that improves i18n and localization in Swift iOS apps - providing cleaner syntax and in-app language switching.